GTD, XYZ and everything in between- it can handle it all. Seriously. 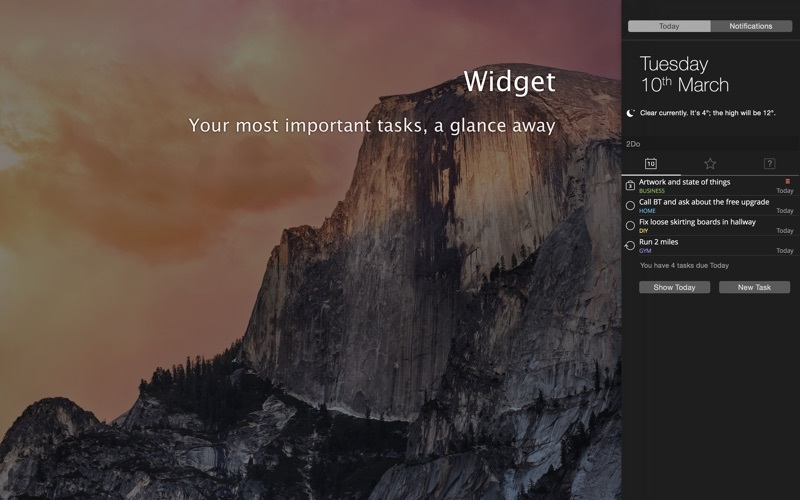 Create simple tasks, or checklists and projects with subtasks. 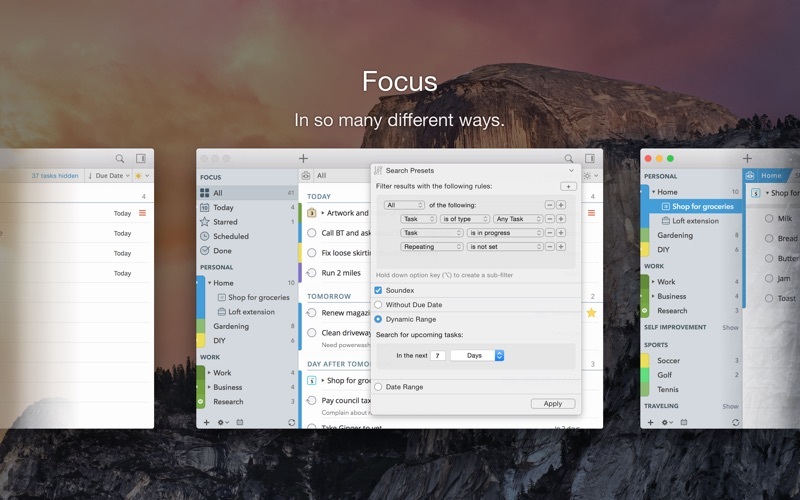 Tasks can have notes, attachments and multiple alarms. In addition to builtin Focus lists that allow you to conveniently view upcoming, starred or scheduled tasks, you can create multiple lists to manage and organize your tasks. Smart lists let you harness the true potential of 2Do using a number of search options, filters and search presets. Using Smart Lists, you can create custom views of your tasks and use them to focusin or find frequently managed tasks. Furthermore, related Smart lists and Lists can be grouped together using a List Group in the order you desire. Manage tags within Tag Groups. Easily assign tags to tasks and vice versa. Leverage the easy to use yet powerful integration of Tags & Smart Lists to filter on frequently managed tasks. Find Used vs. Unused tags with a click. Stay in sync with multiple Macs and mobile devices running 2Do using your favorite sync method over fast and reliable Push Sync: Dropbox, Reminders (CalDAV), 3rd Party CalDAV Servers (iCal, Fruux, ownCloud etc) or Toodledo. Using Dropbox, you can keep multiple devices in sync seamlessly. Devices can be added / removed at any time. Using Reminders CalDAV sync you can keep 2Do and Reminders in sync as well as create tasks using Siri. 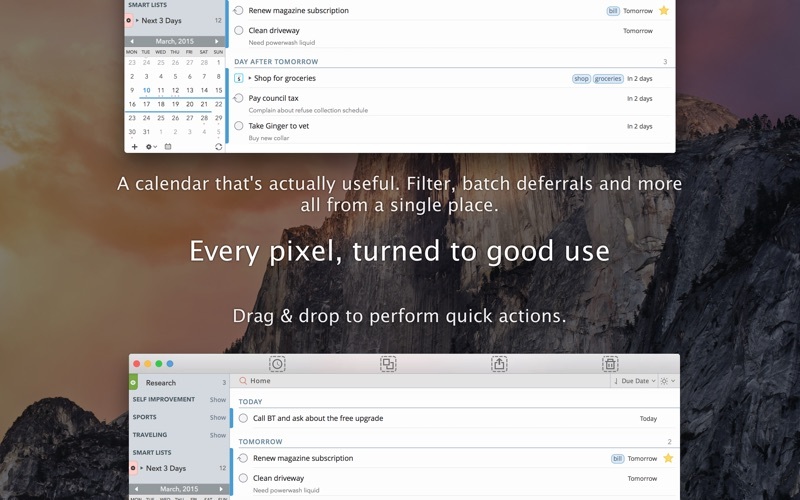 Unobtrusive automatic background sync supported for Dropbox, Reminders (CalDAV) and CalDAV. Save your thoughts as they come to you. 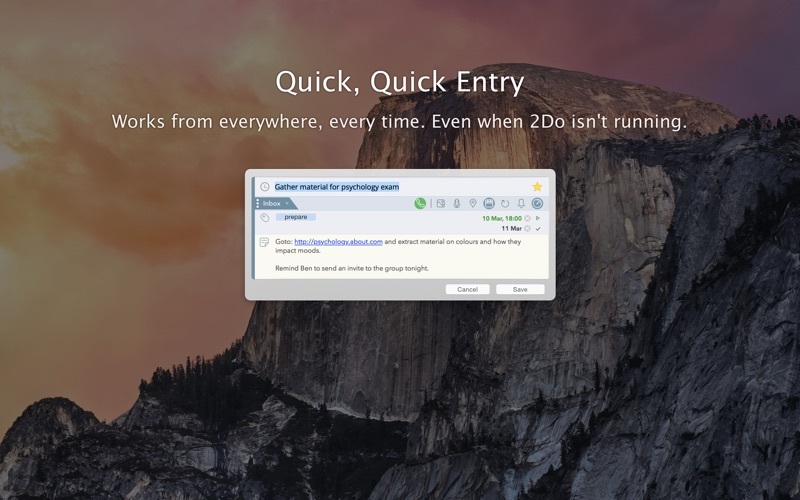 Using a global hotkey, Quick Entry allows you to add tasks from any app or any Space. 2Do does it right. Quick Entry works even if 2Do was not launched or is not running in the background. 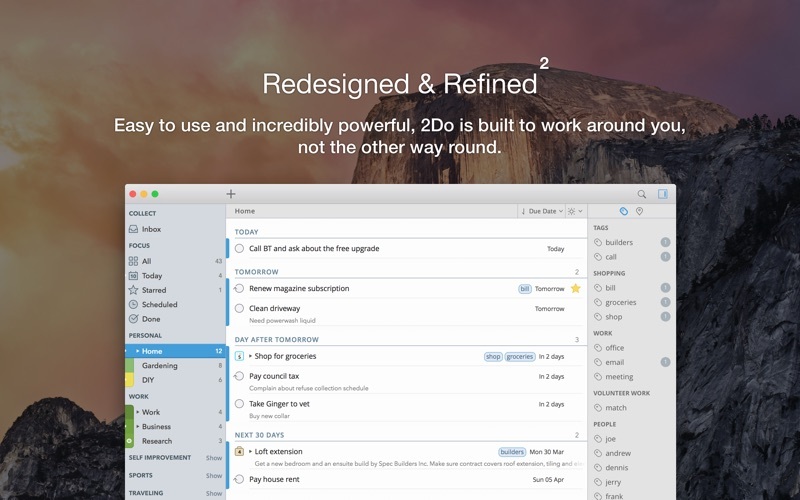 Works just the way Quick Look does in Finder or other builtin OS X apps. Use the spacebar to zoom in and out of a task to preview notes, multiline titles or other details attached to your tasks. Stay on top of your tasks with alarms and notifications. Supports Notification Center as well as a builtin notification system which works even when 2Do is not running. Set up automatic alarms for your tasks. 2Do values your tasks. Periodic automatic backups are created for you which can be transferred from one machine to another or from the iOS version of 2Do to the Mac and vice versa.